Last week on Friday evening, a bus carrying the Humboldt Broncos junior hockey team collided with a tractor trailer, killing fifteen people and injuring at least 14 others. 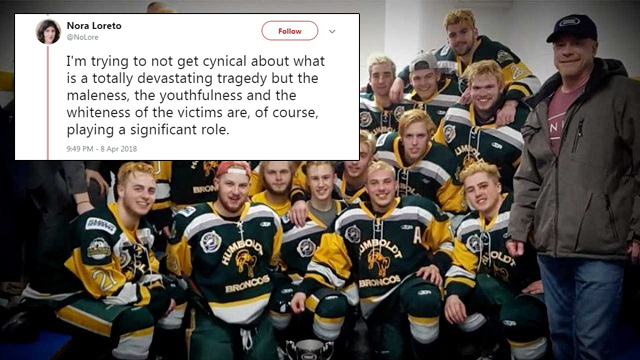 As Humboldt prepares for tonight’s vigil, we’ve been learning more about the Broncos bus crash and its victims. Nora Loreto reacted to the fundraiser with shock, saying: "This is a lot of money." 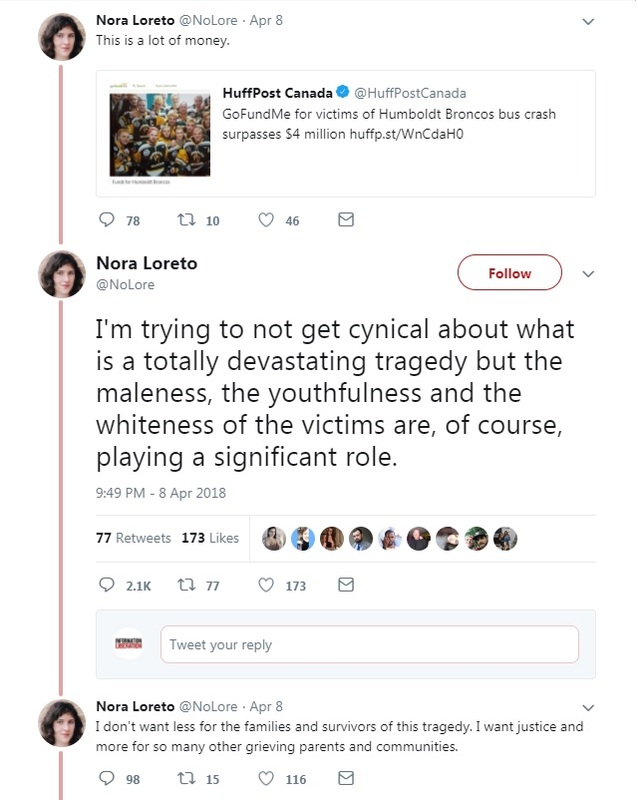 "I'm trying to not get cynical about what is a totally devastating tragedy," Loreto said, "but the maleness, the youthfulness and the whiteness of the victims are, of course, playing a significant role." "I don't want less for the families and survivors of this tragedy," Loreto said in a follow-up tweet. "I want justice and more for so many other grieving parents and communities." Loreto's comments didn't go over very well. They have! And they have nothing to do with a tweet that isn't actually that controversial in context. Yes a bus carrying hockey players in Canada. A huuuge surprise that it is carrying young, white males. Another huge surprise that basically every community in the Country can relate to this tragedy. After her tweet went viral, Loreto spent the next two days portraying herself as the victim. White guys viciously hate being called white. Ok notifications are finally off for people looking to harass me. I'll be able to at least see your replies again.